Home - Andy Esquivel's Scams - Andy Esquivel invents Web Super Hero! Andy Esquivel invents Web Super Hero! Just when you thought Andy Esquivel’s schemes couldn’t get any more childish and insane, he comes up with something that’s so incredibly stupid it makes you wonder how he managed to get out of kindergarten. This is “Super X-Man”, Andy’s latest super-hero. Andy claims to have created this cyber-crime fighting character for i-Safe and for John King’s kids. Both assertions are completely untrue of course, but that won’t stop Andy from pretending that this character had something to do with his Xtagged scam back in 2009. So there you have it – this stolen Zaazu smiley is going to save the internet with fictitious Digital Internet DNA technology that Steve Klemark isn’t smart enough to spell, much less invent, and he would have done it already if it hadn’t been for those pesky fraud victims who keep pressing charges against Andy for stealing their money. In related news, the final pre-trial hearing in Andy’s securities fraud trial has been moved up one week – probably to deal with the fact that Andy still refuses to fully comply with a mutual discovery order issued by Judge Connors over a month ago. The court will likely rule on prosecutor Nathan Lyon’s ‘motion to compel and will force Andy to hand over all witness information, potential testimony, and all remaining documents on pain of a contempt finding. Full case update available here [PDF]. The new pre-trial hearing has been set for May 7th in the same court-room. Hopefully Andy will be able to fly out for the hearing, since it probably won’t end well in his absence. Daryl, that is some funny stuff! Andy, you’re a DOUCHE! Andy has the graphic design skills of a retarded squirrel. 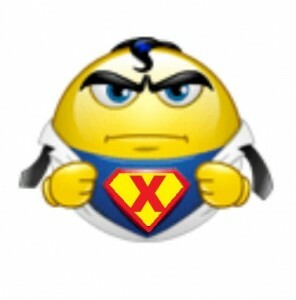 I’m amazed he knows as much as he does to put the X over the Superman logo. Sometimes you have to ask yourself if this guy is really serious or if he’s just pretending to be stupid so people will under-estimate his capacity for criminal mischief.